With a Ph.D. in Clinical Psychology, Dr. Gitanjali currently aims to increase public awareness about the role of clinical psychology and make mental health services more accessible to the mainstream. She started the Dept. of Clinical Psychology at Lakeshore Hospital & Research Centre while working as a full time Clinical Psychologist there. Fulbright Doctoral & Professional fellowship with the Dept. of Psychology, Columbia University, New York. Dr.M.V. Gobindaswamy Memorial Prize for securing the highest marks in Post-graduate Degree of M.Phil. Clinical Psychology. Alexander Memorial Award for Meritorious performance in B.A Psychology. President’s Award in Guiding in the year 1989. 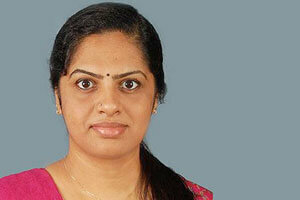 She was a Judge & Expert panelist in “Veruthe alla Bhariya” Reality Show, Mazhavil Manorama TV. She has 6 publications to her credit.